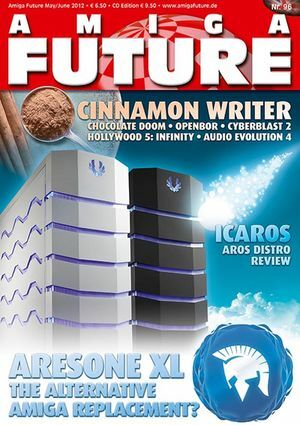 The English and German issue 96 (May/June 2012) of the print magazine Amiga Future has been distributed today, and can also be ordered directly from the editorial office of Amiga Future, and the other Amiga dealers that stock the magazine. From from the issue 94 the Amiga Future magazines will be printed in full colour. A more detailed description of the contents and previews of this issue can be found at the Amiga Future magazine homepage. I know I’ve said it before, but I think it’s great that there’s still a printed Amiga magazine being released regularly. If you want them to continue publishing it, please show your support by ordering an issue or two. It’s well worth it if you love reading about Amiga stuff. I’m more and more impressed with this blog everyday. I’m glad to see that you have stuck to your Amiga guns! Nice work! They sure do! 🙂 Wouldn’t mind having one of those.. Woohoo!! Amiga Future arrived today! 😀 Getting ready for some serious reading.